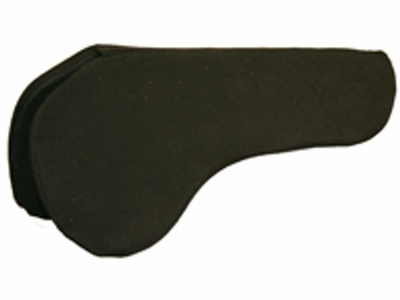 Based on our saddle fitting experience, we've introduced this bridge pad to accommodate a horse with muscle atrophy, or hollows, behind the shoulder blades, prominent withers, and sway back. It's available in two widths: 3/4" or 1". The 3/4" thickness is for a horse with moderate hollows and sway back; the 1" is for more pronounced hollows and more severe sway back. It's designed to fit under your regular saddle pad and is made with memory foam so it fills in the gaps between the horse and saddle. This provides a much more comfortable saddle fit for the horse as it will disperse the rider's weight more evenly. Encased in black, cotton spandex for easy care. *****Bridge pads are not full pads-they are small pads to fit under your normal pad. It bridges the gap between the horse's back and saddle tree to help distribute the rider's weight.